This sentence pretty much sums up what Richa Vashista strives to do! An out and proud queer individual and a mental health professional who has lived her entire life in Mumbai. She has done her Master’s in Clinical Psychology and loves food, travelling and music. · Mental Health: She works towards reducing the widespread stigma around availing mental health services in India. Richa also works as a therapist by providing counselling and also is a facilitator for workshops around mental health awareness. 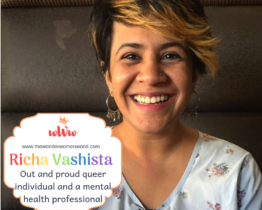 · LGBTQ: Richa has extensive experience in working with LGBTQ individuals in India. She counsels clients with issues around their sexual orientation and/or their gender identity. 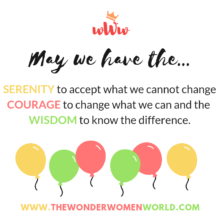 · Gender Equality: She conducts workshops on Gender Sensitization and Gender Equality and applies feminist based counselling for some of her clients. She says, “As a counsellor/therapist, a lot of clients and their experiences can get difficult. There are days I have 4 different cases in my head at the end of the day and compartmentalizing can get difficult. I make sure I don’t carry my client’s issues with me when I am done with sessions for the day and I focus on other things on a personal front.” But on those especially challenging days, Richa turns to music or her family / friends to unwind and get her back on track. When she looks at all that she has accomplished and what more lies to be done, Richa refuses to let it overwhelm her, instead, she says life has taught her NEVER TO GIVE UP on dreams and what you want to achieve. From being an average student in school /college to being at the forefront of causes of social impact. From hesitating to raise her hand in the class room to now boldly raising her voice on taboo topics and encouraging others to do the same – Richa sure has come a long way and has found her purpose in life. She hopes her story helps you find your purpose too. Mental health in India needs a voice and I am glad people are bringing it to the forefront and hopefully the taboo is passé soon!